Yes I have been busy! Thanks for checking up on me. 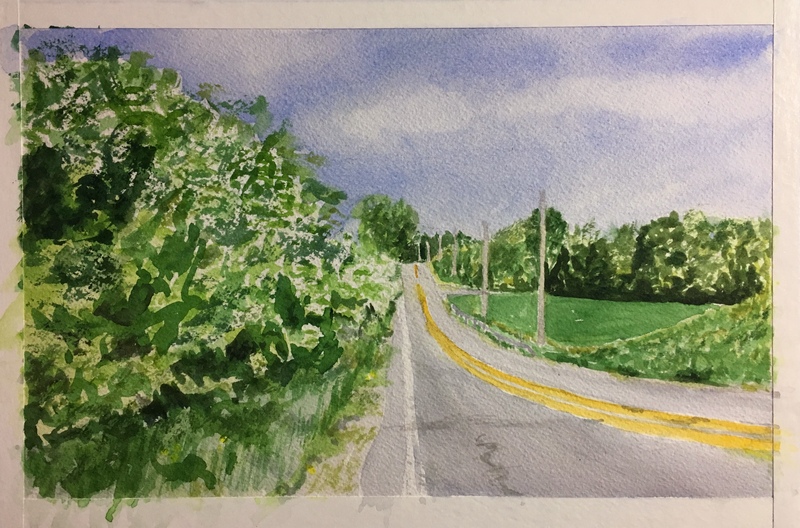 I had a few days off over the holiday weekend and spent it doing some painting, some visiting of Mom, and clearing out of some boxes and other recyclables. Geesh. And laundry. And watching painters on YouTube. And eating. I did this because I had cut up some paper and one piece didn’t cooperate, had a little boo-boo along an edge and it ended up this weird shape. 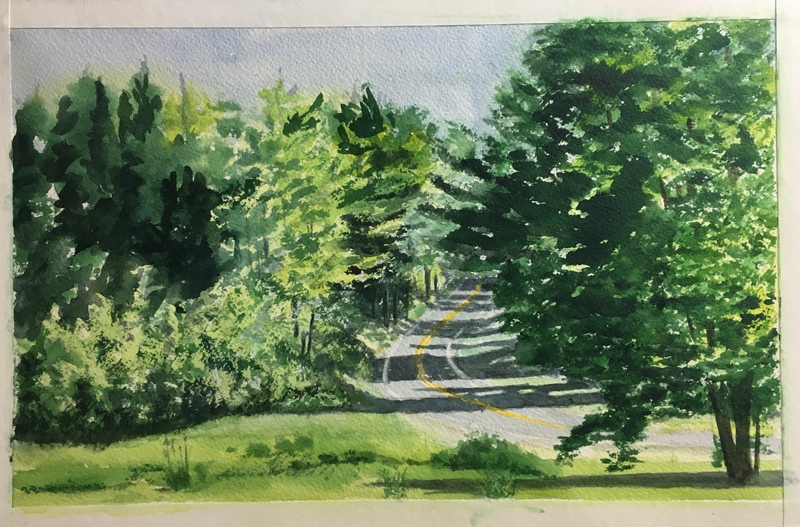 Really just wanted to work out getting some tree/foliage texture going on so I’m calling it a good practice piece but not a good painting. 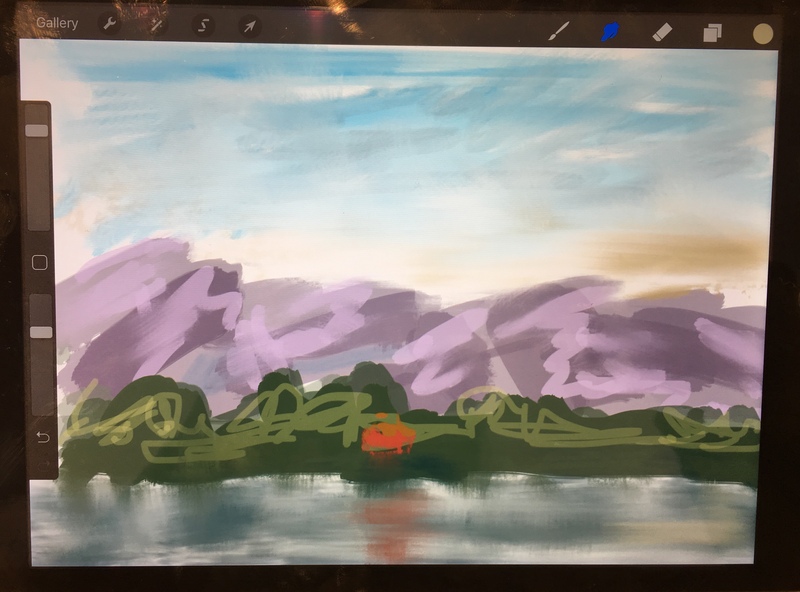 This was done one day at work using an iPad, a Pencil and the Procreate app. 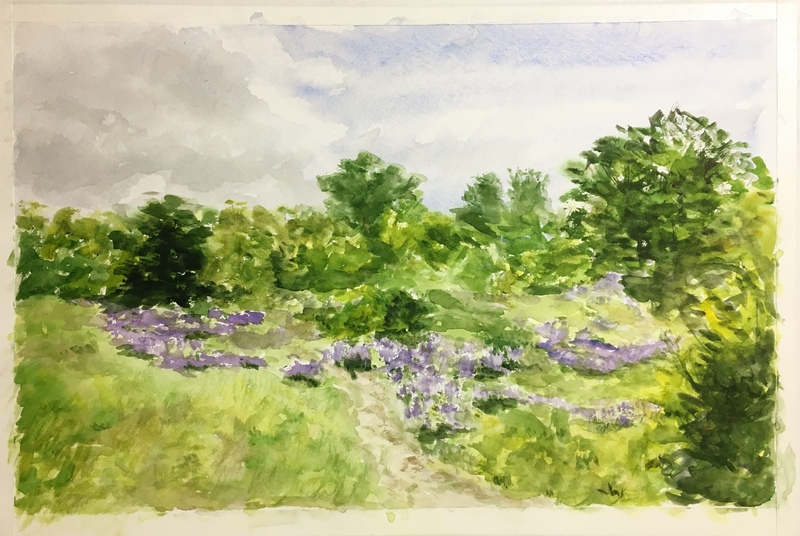 I found some lupines in a field not too far from work so I did this quick sketch from a photo. 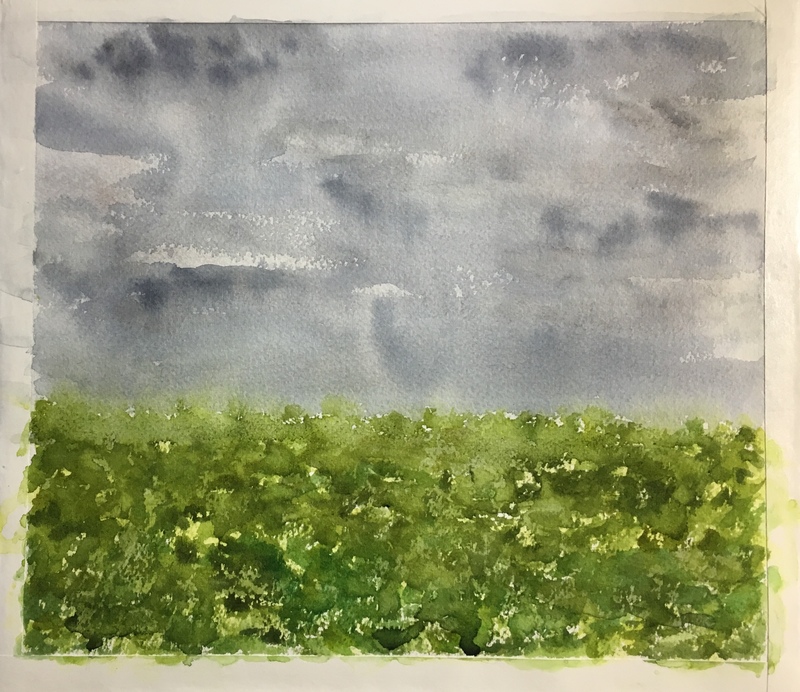 Everyonce in awhile I like to try to paint along with one of the youtube painters I follow, but of course I don’t know what the final idea is and I am too impatient to stop the video to let things dry so I carry on. 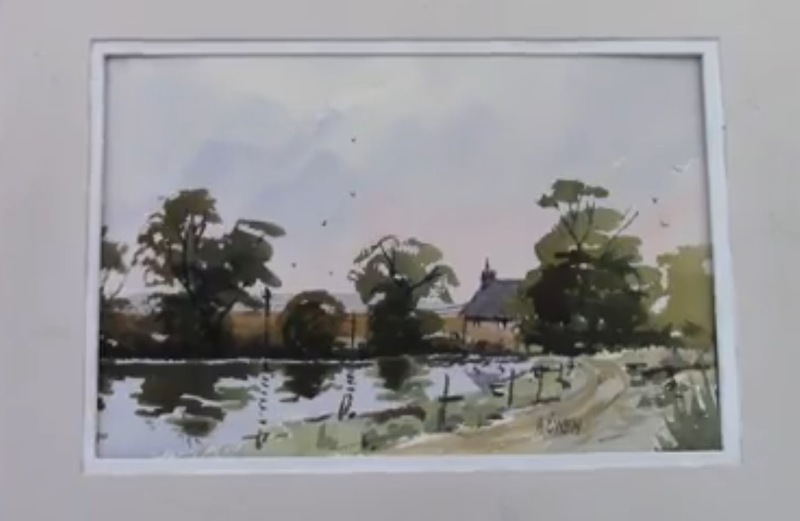 This is a screen shot of the one by Alan Owen of the UK. More to come! Lunch over! Go out into the woods they say. Commune with nature they say. Draw strength from all beings. Yeah. Well sometimes you go into the woods, think deep thoughts and write a big book. Othertimes you go for a walk and stuff happens. The next thing that happens is two birds tumbling through the air together whooped down on me out of nowhere and continued on their way. Whether they were enjoying what we called in Zoology Class a ‘cloacal kiss’ or were joined in a turf war I didn’t get a chance to find out. 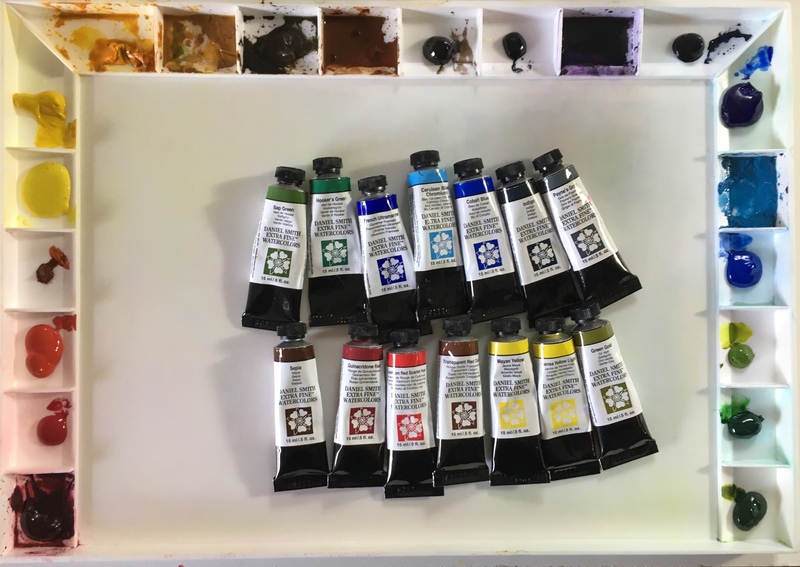 I’ll say that the smaller dabs on the palette are colors that are new to me, maybe seen in a video. I’ve used and tried them but not regularly. But, I’ve more spaces than colors I feel I must have so what the heck – put ’em on there. I usually put a splotch of that sort of color in the mixing area or on the inside of the lid if I want to use some. Also, the space thing comes into the payne’s grey and indigo thing. 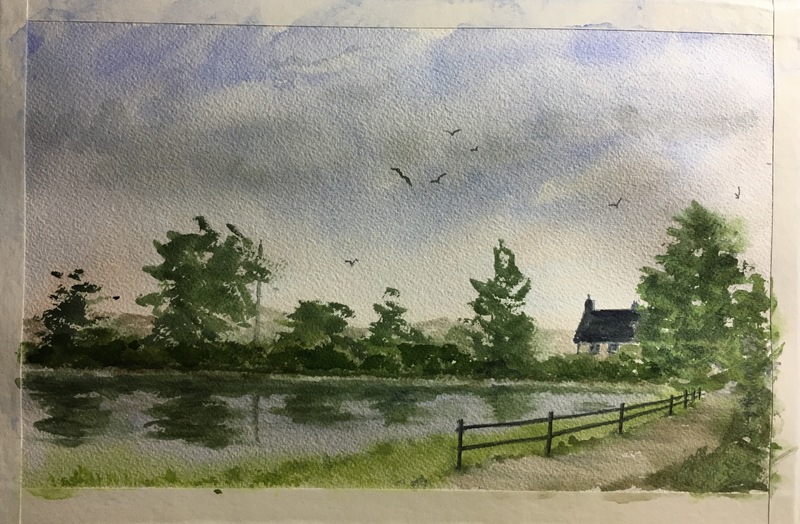 Lately I’ve been mixing all my greys but I have found indigo useful for darkening areas already painted, and sometimes for skies. Looks red heavy but cad red is mainly for mixing darks. 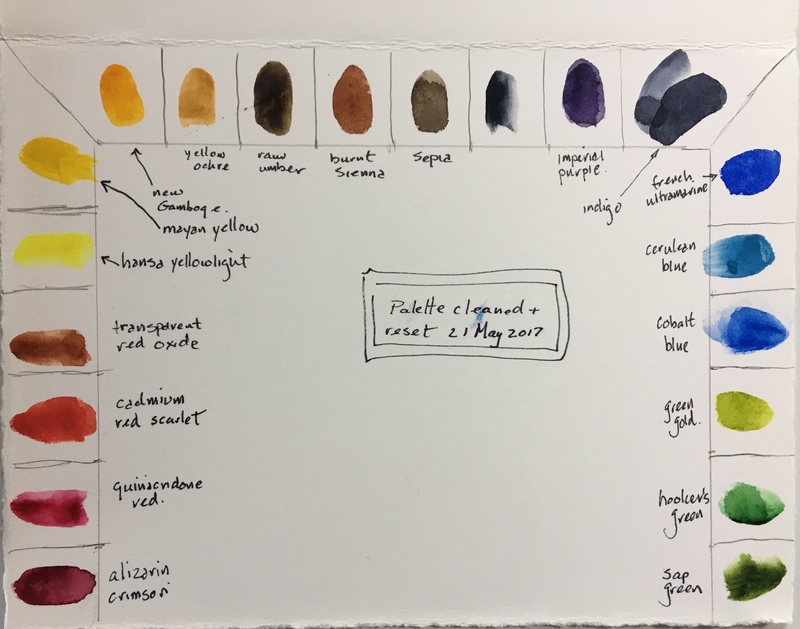 There you go – my second palette layout in my big palette. Overheard at a diner recently. Many many years ago, at some quilt-related something or other, this appeared amongst a set of blocks on display. It wasn’t originally crumpled. I think I did that as a gut reaction when it was brought to me. I may have tossed it over my shoulder at the time. 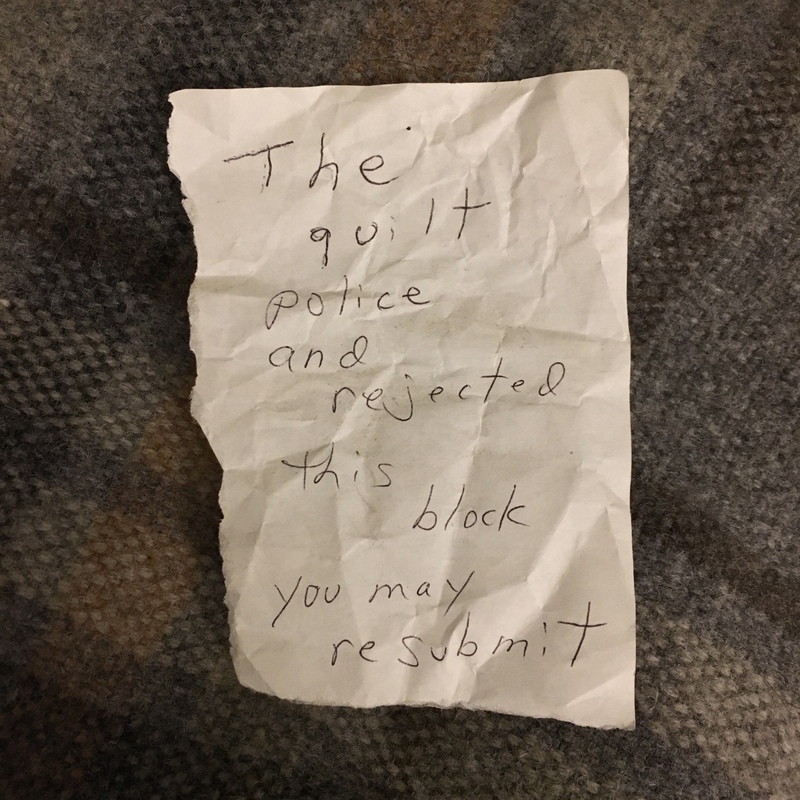 I have never much liked the notion of “the quilt police” and I sure as hell don’t like sneaky little people who leave anonymous mean remarks about someone else’s work. I didn’t much like the willingness of AQS to roll over for a woman who complained about male genitalia on a quilt that contained no such thing. When I was a quilt show bureaucrat I often said that while I carefully read all comments and suggestions about our show, the rage-filled and non-constructive ones which were anonymous got put on the bottom of the pile. I feel strongly that if you have something to say, you should be willing to put your name on it, if only so someone can follow up with you, get the rest of the story, give you more info etc. Start a dialogue. Maybe sign you up to help improve things. As I recall we didn’t tell anyone about this little note but I fished it out of the trash and it went home with me. See the little dot at the top of it? That sucker has been pinned to a little bulletin board in my workroom doorway ever since. Geesh, you’re thinking, that’s sort of grim. Why be reminded of stuff like that? I kept it there – and look at it regularly – as a reminder that people of all walks of life act this way. Quilters aren’t some special lovey-dovey society that is uber sharing and kind and respectful. All the little sub-genres grumble and laugh and point at all the others that don’t follow their interests and “rules”. Quilters are just people, like you find everywhere else, good and bad, and all the rest of it. They fear things they don’t understand. They try to make themselves feel better by putting others down. This week there’s been chatter on the web about other people in the quilting world, small as it is, using social media to ostracize and bully others who aren’t like them in any number of ways. Secret facebook groups make it easy to get people talking about other people. Remember that old cartoon – on the internet no one knows you’re a dog? Well eventually, if you’re hateful and mean, the truth comes out. Doesn’t matter what circle you’re traveling in, there are mean people who try to control with rules and bullying everywhere. I don’t like their behavior. Sometimes I spare some pity in their direction, that their whole life is so fear-filled, so control-lacking that they will do anything to anyone else to try to gain an upper hand and a sense of superiority. Sometimes. Other times I can convince myself to ignore them. These days I don’t think that ignoring bullies is the right thing to do. If you choose to wear an offensive shirt or hat I will try very hard to converse with you as a human and I hope you will do the same. If you are rude to me or someone nearby or generally offensive in your comments I’m going to tell you to stop. Gently at first but firmly. I will not give you the satisfaction of whatever it is you’re trying to do. Hate is wrong but frankly I think you’re mostly full of fear – fear of difference, fear of failure, fear of being outside. Ignorance and fear, the great instigators of hate-behavior. I’m sad your life is full of all that garbage but I’m not stepping in it. What will you do next time you encounter someone who makes racist or sexist or whatever sort of hurtful, ignorant remarks? 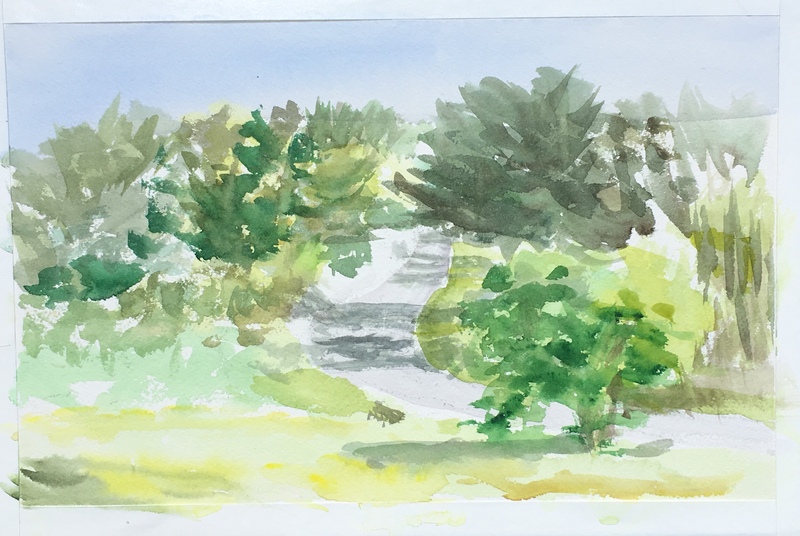 I got a little distracted by an oriole and some territorial canadian geese with a handful of goslings and maybe a fox sparrow and could that be some sort of warbler up there but despite it all some paint ended up on the paper and then I went to the other work. Came home today and sat down to paint. Step by step we reach our goals, right? Added quite a bit, managed to leave a lot of white areas where there would be flowers and realize deep in my heart that dark colors are really something I need to get comfortable with. Very odd since in fabric I’m all about the darks.